Earlier this year, Celebrity Cruises’ Celebrity Silhouette arrived in Southampton prior to embarking on her first-ever season out of the UK. The line, which is renowned for providing contemporary and luxurious cruising experiences, has become popular with UK holidaymakers in recent years for its spacious accommodation options, sophisticated bars and lounges, and divine gourmet dining venues available across all ships. Celebrity Silhouette replaced sister ship, Celebrity Eclipse, bringing with her a wider array of amenities to enjoy. Since her launch in 2011 as the fourth addition to the Solstice-class ship, she has impressed passengers in destinations all around the world and is now amazing passengers on sailings out of Southampton for the first time. This week, Cruises from the UK takes a closer look at what passengers can enjoy on board and how she compares to Celebrity Eclipse. Undoubtedly, one of the most popular areas to be on board the ship is the Lawn – a large, green open space consisting of a real lawn. Situated on the top deck of both ships, this public space offers an ideal location in which to soak up the sun. On certain occasions, you might be able to listen to live music here or even enjoy a traditional game of croquet. On Celebrity Eclipse, guests can enjoy a unique glass-blowing demonstration. 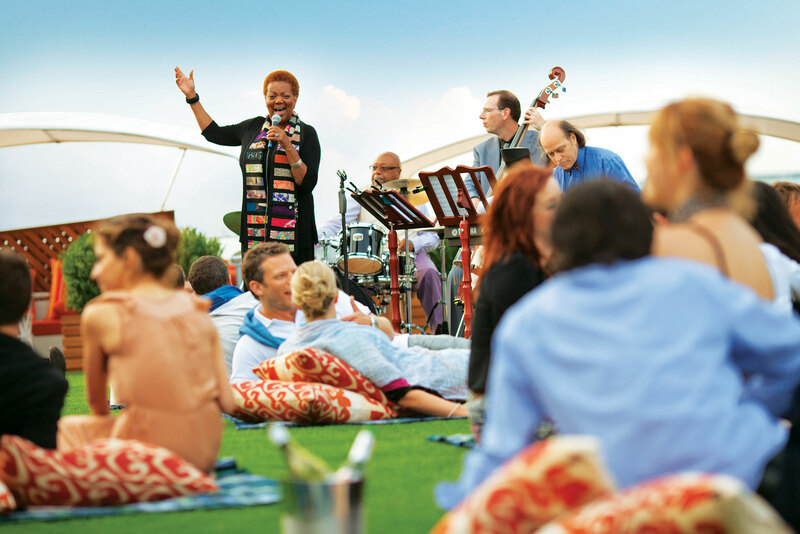 However, Celebrity Silhouette, this has been replaced by the Lawn Club Grill, where guests can enjoy al-fresco dining that you have the opportunity to prepare and cook yourself – see below to find out more! In addition to the Lawn Grill, guests can also enjoy a range of activities on board Celebrity Silhouette. If you are looking for a spot of relaxation and a chance to unwind, you will certainly appreciate the surroundings of the Canyon Ranch and Persian Garden – where you will find a sumptuous spa complete with steam and tropical rain showers. Alternatively, you can cool off in the pool deck and solarium areas or enjoy a spot of peace and quiet in the library. Furthermore, there is the dazzling Celebrity Central theatre, where you can enjoy one of a range of fabulous performances. If you are taking children on board, they will love the facilities available in the respective kids’ clubs. There are many accommodation options available aboard Celebrity Silhouette, with interior stateroom grades going all the way up to the spacious suites. As standard, each room features 100% pure Egyptian cotton linens, a Samsung flat-screen television and a clean bathroom. In each accommodation grade, passengers can also take advantage of 24-hour room service. Going up from this, each accommodation option offers a larger amount of space and a more luxurious range of features. 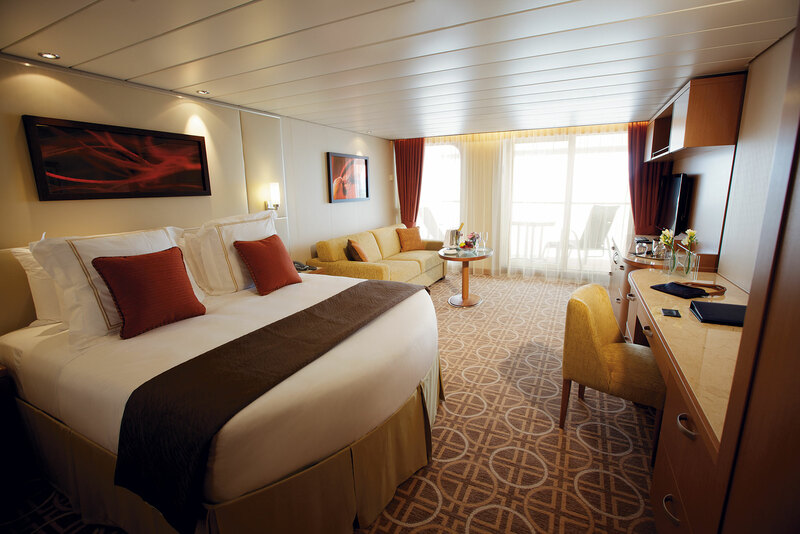 Ocean view staterooms provide all the features of an inside stateroom but with a large window overlooking the sea, while balcony staterooms go one further by offering your own private sanctuary by the sea. If it’s the smaller details that make all the difference, you may enjoy the comfort of a Concierge class or Aquaclass stateroom. In either of these accommodation options, you can enjoy additional extras including priority check-in, concierge service and access to private restaurants and other areas of the ship. Finally, there are the suites, which come in a variety of grades and offer an increasing amount of private space. 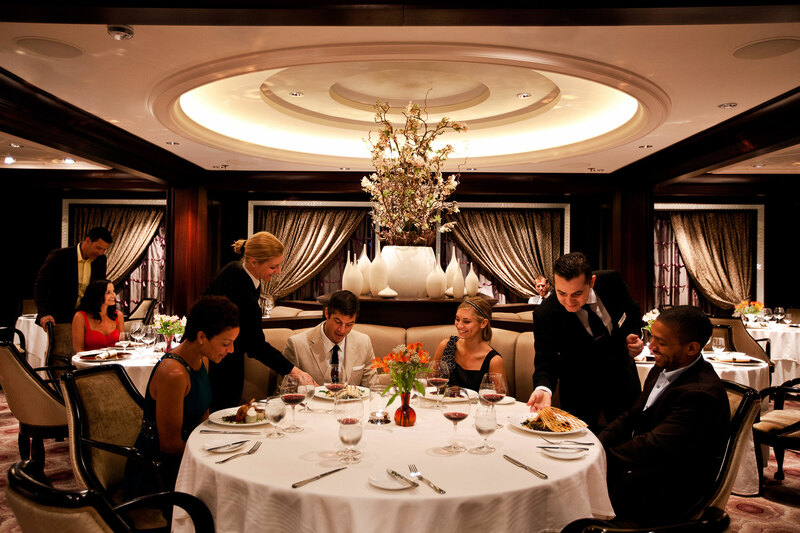 Both ships offer lists of venues that are familiar across the entire Celebrity Cruises fleet. These include Murano (French gourmet cuisine), Qsine (Creative fusion dining), and Tuscan Grille (Italian steakhouse). However, aboard Celebrity Silhouette, guests will also be able to enjoy two additional venues – both of which can be found on the top deck of the ship. These include the Lawn Club Grill – a 58-seat supplementary-cost venue situated in a beautiful spot on the lawn. This venue also offers a unique cookery class, where passengers can learn a range of skills including how to create and cook freshly prepared pizzas. Also overlooking the Lawn is The Porch, which is open for lunch and dinner, offering a menu consisting of the freshest available seafood. To find out more about the offering available with Celebrity Cruises or to make a booking, contact our friendly Cruises from the UK team via the freephone number above or complete the online enquiry form.